Cristela Alonzo records a social media video with Anna Garcia, 14, in a neighborhood while campaigning on Friday, Nov. .2, 2018, in San Juan. 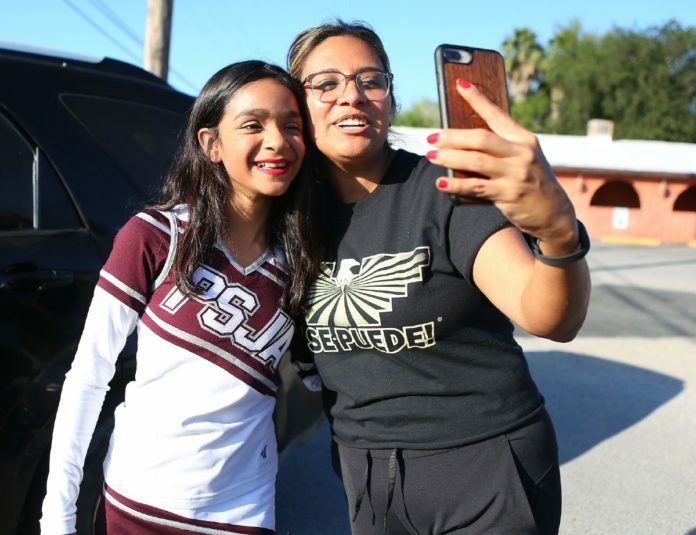 On the last day of early voting, actress, comedian and San Juan native Cristela Alonzo attended several events across the area alongside Democratic gubernatorial candidate Lupe Valdez. Cambio Texas, People for the American Way and La Union Del Pueblo Entero, or LUPE, organized the day’s events, which were originally going to feature civil rights icon Dolores Huerta, who was unable to attend due to health complications. Valdez had planned campaign stops along the border. Valdez, who served as sheriff of Dallas County for 13 years, said the record number of voter registration and turnout this election, particularly along the border, has her optimistic, despite most polls putting her at least 20 points behind incumbent Gov. Greg Abbott. Both Valdez and Alonzo said the Rio Grande Valley is often written off in statewide races. Alonzo, who grew up off 4th Street in San Juan, said this has long been the case. When she saw candidates like Beto O’Rourke, the popular Democratic candidate running to unseat U.S. Senator Ted Cruz, visiting the Valley so often, she decided to get involved in this midterm. Often, immigration is the only issue associated with Latino voters, Alonzo said. As a result, issues like health care, education and law enforcement are not thought of with Latinos in mind, and voter apathy grows. It’s no coincidence Latinos vote less than other demographics, Alonzo said. Tania Lopez, a California native and resident of Edinburg, stopped by the Lark Community Center in McAllen to cast her ballot in Texas for the first time after living here for years. Early voting ended Friday, meaning that by the time Alonzo and Valdez left the Valley, most of the ballots for this midterm had already been cast. Election Day is Nov. 6; for more information on voting in Hidalgo County, visit: https://www.hidalgocounty.us/105/Elections-Department.